Harrison Birtwistle (born 1934) is one of the UK's half dozen or so leading composers. His music is for the most part symphonic and operatic, richer in wind and percussion instruments than strings (unless you count the harp). 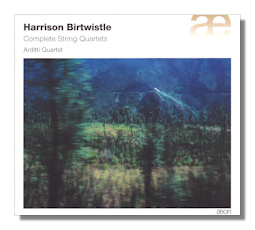 Now here is a splendid CD from Aeon containing both Birtwistle's excursions in the medium of the string quartet… the almost hour-long Tree of Strings string quartet [tr.1] and the nine movements (five entitled Fantasia (1,2É); four Frieze) [tr.s 2-10] all played by the Arditti Quartet, a highly appropriate choice for such music. Of course strings are not entirely absent from the output of Birtwistle: many of his works throughout his now happily long career use strings. But exclusively the special interplay and bonds upon which the self-contained and untrammeled string quartet is built are explored in these two works. Tree of Strings is tight, compelling, somewhat claustrophobic without being inward-looking. Things reveal themselves by our sense of their deliberateness, the slow pace with which new material is introduced and developed. Percussive writing and groups of gently staccato ambiences seem to dominate over long lyrical lines. This is not music that's driven by percussion, beat, dance or harsh rhythms. It's music that explores sonic ideas and how the medium itself speaks to us. At the same time, the lyricism and beauty which are characteristic of Birtwistle's style predominate. As does the use of each of the three instrument's full tessiture. Above all the work privileges the many exciting, stimulating and meaning-charged ways in which two violins, viola and cello can make dense, light, ominous, uplifting, insistent, relieved, understated, unambiguous and familiar music as well as mixing striking textures together. The four instrumentalists of the Arditti's observe another gesture from Birtwistle in performance: empty chairs are placed around their conventional semi-circle to represent that loss of population on and from the Scottish island of Raasay, on which the composer lived in the 1970s and 80s. (The work was written in 2007, though). Without arrogating to the music a "program" as such, it is surely relevant to draw attention to the rhythmic interlocking, the growth and diminuendo dynamics as well as use of synchronization of silences and the emergence (and disappearance) of ideas. These currents in human affairs are descriptive, at least, of societies under (external and unwanted) pressure such as those of some of the threatened Scottish Highlands and Islands in recent centuries. But Birtwistle's Tree of Strings is more subtle by far than any kind of manifesto or propagandist work. And the Ardittis approach it as such. With great sensitivity. The slightly longer Movements for String Quartet seems to take up Birtwistle's interest in ostinato. He uses that musical style less to suggest objects that come in and out of focus. Rather that they must assert their independence – both from one another, and from any external idea(s). Thereby (perhaps paradoxically) a musically convincing holistic entity is built. This, of course, requires great perception by performers. This the Arditti Quartet has in abundance. To make it work of course needs near genius by composer as well. But such has been Birtwistle's career. In some ways he has led the progress of post-War British music in imagining and fulfilling structural promise, as perhaps Stravinsky did almost a century earlier. The Frieze 3 movement [tr.8] is terse without being compressed, for instance, and makes much of its impact comes from the ways in which we hear across and along the gentle episodes ("bursts" would suggest music much less integrated, much harsher and disjointed than ever Birtwistle wishes to be). But there is separation between musical ideas. There is distilled concentration, too; yet not like Webern. Birtwistle, rather, seems content that we revel in the sounds as much as the notes revel with him. Certainly Birtwistle's music arouses and stimulates; at times provokes even. But it remains beautiful and conceived holistically. One senses that he knew the ways in which the final bars would sound before ever beginning the first ones of the multi-movement work on this CD as much as of Tree of Strings. This makes the Arditti Quartet's achievement all the more remarkable. They too play the music both with wonder and respect. These are qualities which only come from familiarity, and some surprise and delight, which reflect the sense of spontaneity and freshness with which all Birtwistle's music is shot through. Though a lightness, freedom and total absence of apparent adherence to method or formula characterize every bar on this hour long CD. Yet when you realize the organic and incremental way in which these movements have been composed and augmented over time, the unity and sense of wholeness conferred by the players is all the more satisfying. A final assessment of the Arditti's skill and persuasion in playing these works (technical brilliance is a given!) is the way they handle the two works' endings. More with the formality (yet not devoid of warmth) of a waiter at the end of a long and enjoyable meal than a grandparent at the end of a visit from loved children. Yet attachment there is. Love even. But a determination by the players that the music should speak for itself, needs no introduction and certainly no gloss. The acoustic is clear and close. Appropriately so. And the booklet is suitably full of relevant detail and context. If you're an enthusiast for Birtwistle and/or contemporary (European) music, you'll want this CD. If for no other reason than the balance it strikes between surprise and beauty. Birtwistle string quartets emerge as far from "afterthoughts" or excrescences. They illuminate Birtwistle's achievement in a unique way. These performances of them are exemplary, persuasive in every way. Recommended.